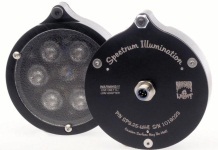 This spot light, manufactured by Spectrum Illumination, can be used for either bright-field or dark-field illumination. It projects lots of light despite its compact housing. It can be mounted 12" to 20' from the object to be imaged. LED optics and diffuser options are available that make it possible to obtain closer working distances and/or larger coverage areas.